I'm going to jump right in to Part 2 of our step-by-step guide to planning the design of your bathroom remodel. There are many options for bathroom flooring, but the best choices are sheet goods and tile. Sheet goods can be vinyl or linoleum. 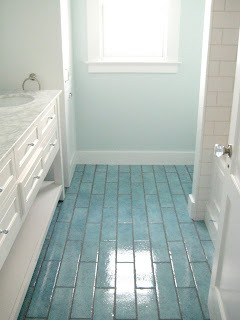 Linoleum is usually ugly, but it's inexpensive and practical. There is an aesthetically superior alternative called Marmoleum, which is a natural linseed sheet product with a jute backer. It comes in a wide array of colors and is earth and asthma/allergy friendly. If you can afford it, the best floor for looks and durability is tile. Tile can be ceramic or stone, and comes in every color, shape, and size imaginable. Take your cabinet and countertop samples with you when tile shopping. If you are planning to tile the shower surround or walls, you'll want to make sure all the tiles work together. In our Little Blue Cottage, the kids' bath on the left has 4"x18" Maioliche Vesuvienne Bianco tiles, which are only $4.95/sf at Import Tile in Berkeley. 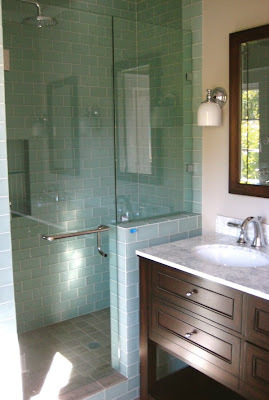 The master bath on the right has floor tiles from Walker Zanger. 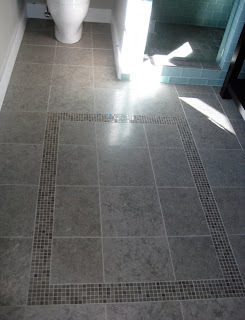 The large tiles are 12"x12" shetland gray stone and the accents are 5/8"x5/8" lagos azul mosaic. Notice that nowhere did I say that carpet is an acceptable choice for a bathroom floor. Do I need to reiterate? Never put carpet in a bathroom floor. Ever. Hardwood is also not a great choice. It's definitely not durable enough to hold up next to a shower, although it can sometimes fly for a powder room. Engineered wood is better than actual wood (it moves less), but neither are good. This step is only if you are not going to use one of those prefabricated drop-in acrylic or fiberglass surrounds. Grab your heavy bag full of samples and head to your local tile store. You are looking for field tiles (the ones that make up the large span of wall), accent tiles like a border or inside a niche, and caps for the top. Here are two examples from our Little Blue Cottage. The kids' bath has white 3x6 subway tiles from the Tile Shop in Berkeley. These are a great deal at $3.68/sqft. 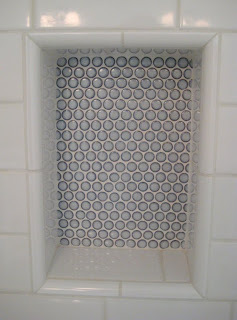 There is an accent strip also in white near the top and the shampoo niche is done in Ann Sacks penny round mosaic in sky matte. 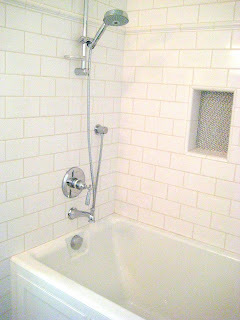 The master has gray/green glass 3"x6" subway tile from Import Tile and the same tile, but in a longer 1 1/2"x9" size for the shampoo niche. Large tiles are fine for a bath floor, but you'll want a smaller version (around 4"x4" is ideal) for the floor of a walk-in shower. The grout lines serve as extra traction for safety and allow the installer to get the proper slope to the drain. Unless you've successfully installed tile before, this is a job best left to the pros. Get samples of all the tiles you want to use and have your tilesetter place the order. They'll have a better understanding of the square footage required, and also of what trim tiles you'll need to make to the design a success.